Unfortunately, our wonderful semester of permaculture has come to an end. I don’t think, though, that it’s principles and practices will be forgotten by the five of us as we continue to define our lifestyles and decide how we want to eat, use energy, waste, buy products, and interact with the world. We were a small class, and that gave us the opportunity to experience some really neat, hands-on activities and discussions. Each week we read one or two of Holmgren’s principles, and then we focused on those during our class period. For example, after reading Principle One: Observe and Interact, we went for a walk through the Arboretum and actually practiced observing and interacting. It was neat to watch our textbook’s ideas in the real world, which is something we don’t always get in other classes. The week that we read Principle Six: Produce No Waste, we conducted Holmgren’s Self Audit to see what waste (of time, energy, or money) we were producing. It was interesting and made me evaluate what I spent my time doing. It was neat to hear how others in the class had actually made significant changes (like dropping calc!) based on their audit. 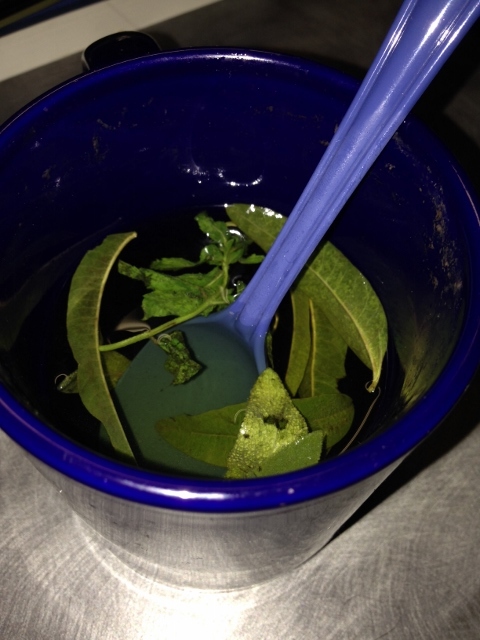 As we walked through the campus farm’s herb spiral or talked with permaculture business owners or visited the honey bees, we talked about what made these things different – how, specifically, they applied the permaculture principles. Even talking about school work or our future plans, it was amazing how relevant the principles were! Overall, I liked the structure. My favorite part was that we were rarely in the classroom – I loved visiting the campus farm and the Arb. Even on the days we were in the classroom, we had guest speakers, never just lecture. I think this kept us more engaged. I think that maybe the blogging, reading, magazines, and out-of-class assignments were a bit too much. I really enjoyed the out-of-class assignments (Farmers Market, Food Co-op) and didn’t mind blogging, so I would keep these two. But personally, I found the textbook to not be engaging. This might have just been me, but I had trouble getting through each principle and kind of zoned out as I read. What about a one-page summary handout of each principle on CTools? These would be easy to read and easy to refer back to. I think all of my blogs are in. Please let me know if I’m missing one! Not as my final assignment, but I’m also looking into internships for this summer. I’ve found two that I really like (though I’m looking for more! ), attended an info session, emailed the director, and plan to apply over winter break. I’m about to eat lunch with friends (to eat and socialize and provide a break from homework and plan a club project we have coming up), and later I’m going to run to my committee meeting at the Union so I get there faster and get my workout in. Yay for stacking functions! I started a three-day waste journal at the end of September, to try to capture my “beginning of semester” waste habits. Below is the result. Hopefully at the end of the semester I’ll do another three-day waste journal and see how they compare. My definition of waste: Anything that I put in a trash can or even recycling bin (I include recyclables because it takes so much water and energy to recycle, and ultimately it would be better for me to not use the bottle, etc. at all) . I also included organic matter, like apple cores, as waste because I’m pretty sure that the only dining hall that composts post-consumer waste is East Quad, and I didn’t eat at East Quad on any of these days. Below is my op-ed on what permaculture means to the general public, which I submitted to Permaculture Activist‘s “Movement Musings” section. I am a university student, a freshman learning for the first time to live on my own and deciding what kind of mark I want to leave on the world. I’ve always supported “sustainability” and “environmentalism,” umbrella concepts I threw around without completely understanding their meanings. I recycled, turned off lights, picked up trash, and didn’t eat meat; my family ate mostly organic. But I worried. I worried about the shrinking glaciers and the heating atmosphere and America’s colossal energy waste, and I felt powerless to stop these trends. I wanted to do more. So, as I thumbed through my college’s fall course guide earlier this summer, I decided to finally educate myself – I saw the word ‘permaculture’. I’d never heard of permaculture, and even as the class began I struggled for weeks to find a definition that made sense to me, that differentiated it from the concept of sustainability that I was more familiar with. It is a small class, taught by a knowledgeable and passionate fellow student who has started a permaculture club and co-founded our campus farm. We read David Holmgren’s Permaculture: Principles and Pathways Beyond Sustainability and trade issues of Permaculture Activist. We’ve visited a permaculture research and design lab, identified plants and their uses in our town’s verdant arboretum, collected herbs at the campus farm, and heard speakers from local permaculture-guided companies. For homework, we visit the local farmer’s market and food co-op, attend campus events on the environment, conduct Holmgren’s self-audit, and keep waste journals. I’m learning new things every week – for example, I was shocked when I calculated my Ecological Footprint and found that my lifestyle, which I had always considered fairly environmentally-sensitive, would require four planets worth of land to sustain. It has been an adventure into what seems to me an entirely new world. I was initially overwhelmed by how drastic the commitment to permaculture seemed. For example, consider buying food. I could go to the grocery store and buy organic, but then it isn’t locally grown. So I could go to the local farmer’s market, but then all of the farmers have to drive separately each day, and is this actually wasting more energy? It seems like the only solution is to grow my own food, and as a broke college student living in a 10’x11’ dorm room, this is difficult. Another frustration is how big the problems seem. In the aforementioned ecological footprint calculator, I automatically start at three planets worth of waste, just by virtue of living in the United States. Our system is so tangled in and dependent upon wasteful energy use that even the most conscientious citizens have trouble avoiding it. Short of building my own small, self-heating, off-the-grid home, what can I as an everyday citizen do to both reduce my individual energy waste and bring change to the larger system? I feel that from the trenches of the permaculture movement, after spending decades completely devoted to the lifestyle, it might be easy to forget that not everyone in the general public understands permaculture and its principles, and you might feel frustration at our lack of support. I hope I’ve provided an “outsider’s perspective” to help you appreciate where we are coming from. I think for the most part the public wants to help but doesn’t quite know how. The permaculture principles can be overwhelming and overly theoretical, and sometimes it seems as though committing to a permaculture lifestyle is “all or nothing,” either moving to the country, building a house by hand, and growing one’s own food or not making any changes at all. It would be incredible to move to such a low-energy future, of course, but maybe by offering smaller, more incremental, more accessible steps, the permaculture movement will be able to garner more public support. I want to thank the permaculture community for its efforts. Though I have so much more to learn, I realize now more than ever how important permaculture is. I have truly been inspired this semester. Last week, standing in an herb spiral with my classmates on a beautiful fall day, munching on clover and goldenrod and discussing the future of the campus farm, I felt so at peace. This could be the future. As society moves into a less energy-dependent state, we need to ensure that our lifestyles, businesses, and infrastructure are sustainable, and I think that permaculture holds the key to doing so. 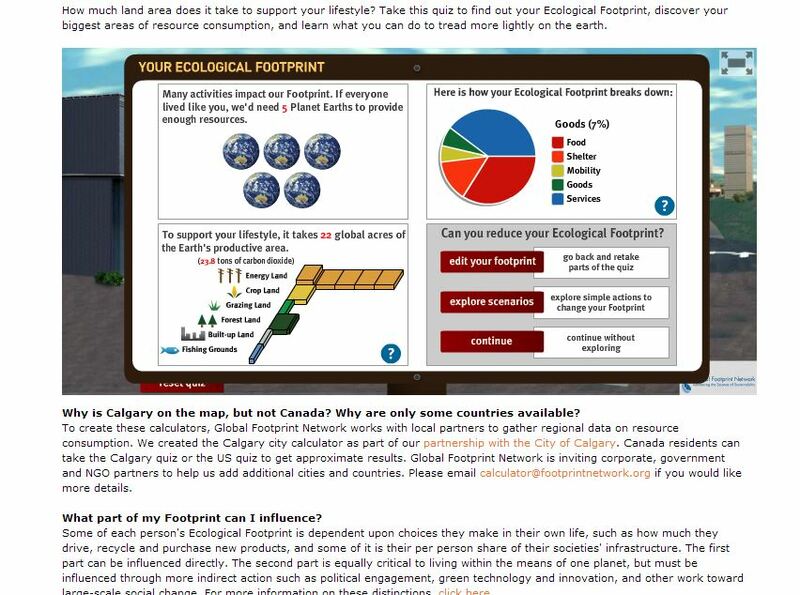 This week, I decided to calculate my ecological footprint using footprintnetwork.org. 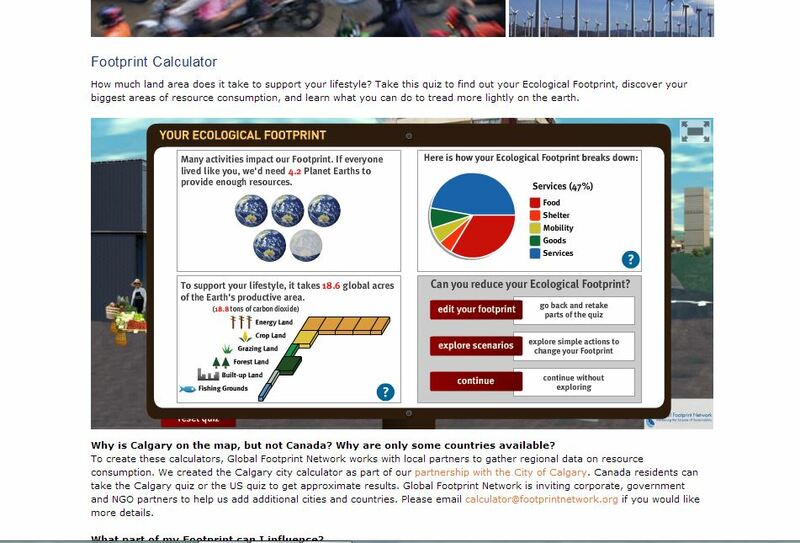 It’s a really cool, interactive website designed by the Global Footprint Network. After you answer several questions about yourself, it gives you a rating: the number of planets it would take to support your lifestyle. I think this is an impactful way of forcing people to acknowledge the damage they’re doing to the earth. First you select your location. Just by virtue of living in the US, we automatically get something like three planets (which is crazy!!). Even developing countries, however, average more than one planet – the human lifestyle is simply not sustainable right now. Then the lifestyle questions begin. I’m a vegetarian and rarely eat eggs and dairy, so that helped me. It asked questions about how much of my food is processed and not locally grown (a lot) and how much trash I generate (not much at all, I’m pretty careful about this and don’t really buy things. But “compared to the typical American”? That’s kind of hard to judge). When it asked me questions about housing, I was unsure of how to answer. Right now I live in a dorm, pretty close to a “multi-story apartment building,” but at home I live in a excessively, luxuriously large house. I decided to go with my dorm, to calculate my footprint right now. I have one roommate and electricity. Calculating square footage of my home was unsure, too – I mean, my dorm room is 11×12, but that doesn’t include where I eat or the lounge where I sometimes study. Also right now, I drive a car much less than at home. I do fly a few times a year. In the end, I decided to calculate two footprints, one for life in the dorms and one for life, say, at home in the summer. They were different! FIVE PLANETS!! 😦 It really makes you realize the negative impact your lifestyle has – things you do without thinking like living in a house or having running water. The website also had a thorough FAQ explaining why only some countries could be selected and the parts of our footprint we can influence. I looked through one of the oldest Permaculture Activist issues this week, and I found an article that was really interesting, especially when considering how its topic has developed in the thirteen years since it was published. It was titled “GMO? I Don’t Know” and was a review of a a book about GMOs (genetically modified organisms) in our food (with a forward by Ralph Nader!). The book was apparently harshly critical of the big industry “genfood” movement, citing companies like Monsanto who were abusing this technology without regard for the consequences. The debate is still raging today. GMOs have spread, to where now 94% of US soy, 90% of cotton and canola, and 88% of corn crops are genetically modified – and over 80% of US food in general (http://www.responsibletechnology.org/gmo-basics/gmos-in-food, http://www.nongmoproject.org/learn-more/gmos-and-your-family/). Right now I like to see “GMO free” on a label, but I don’t actively search for this designation. Should I begin to? I do worry about the effects it will have on society’s health, and there have been some studies linking GMOs to cancer in animals. The article explained that genfoods are “fraught with potential perils, offer no known benefits to consumers, and in some cases have been shown to be nutritionally inferior to their natural counterparts.” It warns against “changing the nature of nature,” and I agree. The pushback against GMOs seems to be gathering steam, but I think more focus needs to be put on bringing the issue onto the public agenda. Side note: I’ve joined the Food Recovery Network, and my first shift is this Thursday! We collect the uneaten food from the dining halls, which normally is just thrown away (!!! ), and deliver it to Food Gatherers. Isn’t that an incredibly simple and brilliant program? I think it really demonstrates permaculture principles, like Principle One: Observe and Interact. Someone observed that something like 40% of dining hall food goes to waste, and so they decided to interact with this environment to create a simple solution. Side Note 2: I’ve been more conscientious of my waste lately. I’ve stopped taking handouts in the Diag and stopped using paper towels. I’m also trying to keep up my “zero waste during dining hall meals.” Small steps, but they add up! This week, I read an article in Permaculture Activist magazine entitled “How Ecovillages Care for People.” Ecovillages are defined as “human settlements that focus on ecological sustainability and demonstrate and teach this for others.” They focus on social/cultural/spiritual and economic sustainability as well and often employ many permaculture principles and practices. The author lives in an American ecovillage called Earthaven, and she gives a vignette about what daily life is like for her – her and her mother live in a small passive solar building, collecting rainwater and composting, walking everywhere and earning a living in the village. So cool! The ecovillage movement started in 1990s, and has since spread across the world. They are self-governed and kept small enough that every member can play a role. There are three types: intentional community-style ecovillages (the most common and the type the author lives in), sustainability education centers, and traditional indigenous villages. The author explained two ways that ecovillages care for people: they care for their own and care for others. They care for their own by making sure that the community members are provided for. Many have jobs within the community, like farming and running small shops and teaching. Others work outside of the community, or work online or over the phone. They care for others through lots of service. They foster children, run summer camps, launch peace-initiatives, and help natural disaster victims. They tend to be very selfless and humble. To me, this is a pretty radical concept. However, reading about it, I can see the merit. It’s really beautiful, the way these people are living, in touch with nature and caring for one another. They are committed to nurturing the earth, a novel concept in today’s money-hungry and reckless society. When I hear “ecovillage,” I tend to think of a more off-the-grid, technology-free life. However, these people have embraced technology to a point, building internet cafes, running websites, and using science to design their communities. It seems like a good model, and I could definitely see the ecovillage movement growing in the future. I know the point is that it’s small-scale living, but what if we took some of the ecovillage concepts and slowly began to apply them to society as a whole? On a larger scale, would ecovillage practices be able to hold up? Some of their methods could really change the world and reverse so much of the damage that has already been done.